When Can a Baby Have a Pillow? After you choose your crib, you’ll really that blankets and pillows are not included. These leads many mothers asking, “When can a baby have a pillow?”. 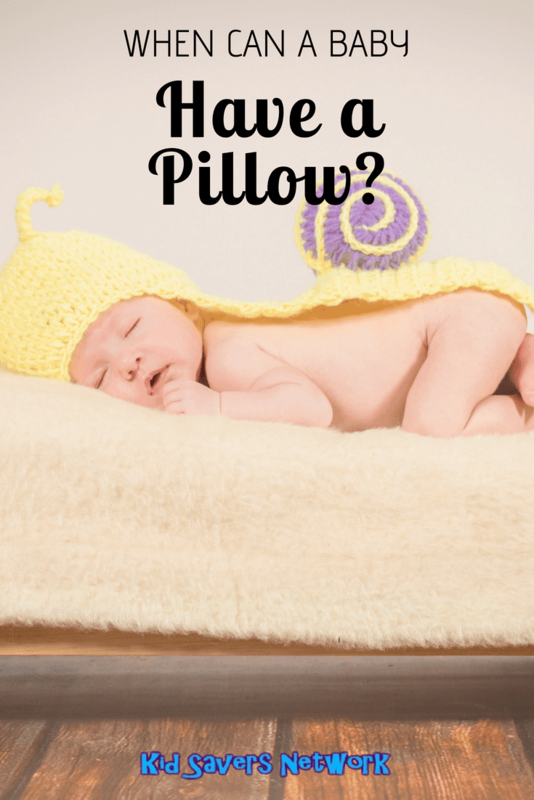 In this article, we’ll explore some of the issues around baby pillows and the correct time to use them. Why Are Baby Pillows Dangerous? Is No Pillow Uncomfortable For My Baby? Will my Baby Get a Flat Head? 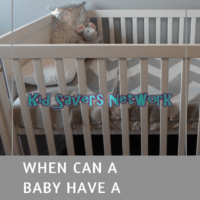 The American Association of Pediatrics recommend that all cribs be kept free of clutter. No bedding, no blankets and no pillows. These soft items represent a suffocation hazard to infants. Approximately 1/2 of all crib deaths and 2/3s of bassinet deaths are attributed to pillows, cushions blankets and over-crowding in the crib space. An infant is most at risk in the first 3 months of their lives. However, many people do start using pillows when a baby graduates into a toddler bed, or before. Since the government launched its “Back to Sleep” campaign, the incidences of SIDS has declined drastically. If you think about it, a baby sleeping on it’s back on a pillow is pretty harmless. The problem is if your baby jostles to the side or lies face-down. For around the first 6 months of their lives, an infant’s neck is weak and floppy. It hasn’t yet developed the muscles and control needed to control its neck and head. You can imagine if they are lying face down pressed into a pillow they will smother themselves. This is the same reason a baby can drown in just 2 inches of water. Suffocation can also occur from a sidewards position as well. It’s likely you can’t imagine sleeping without a pillow. Fortunately, adults and babies are quite different. A baby has a proportionately bigger head with a smaller windpipe. The shape of their heads elevates them slightly off the crib mattress. This helps keep an infant’s airways open, too. Many parents worry that a firm mattress will lead to “Flat Head Syndrome”. Whilst this can be true, the risks pale into insignificance with the risk of SIDS. To prevent flat head there are a number of special pillows for a baby’s waking hours. The American Association of Pediatrics also advises that your little one gets lots of tummy time. If you search the internet, you’ll find that quite a few parents do give their baby some form of a pillow at around 8 months of age. By this time, they have better head or neck control. Personally as a mother of a toddler and an infant, I think it’s wise to keep all risks to a minimum. As mentioned above, the first 3 – 6 months of a newborn’s life are vital. After this, the risk of SIDS lessens and it reduces significantly after 1 year old. To be absolutely safe, wait until 2 years old. As always, please consult your peditrician and don’t take things you read on the internet as gospel!